This morning I took part in the Organization for the Assabet River's (OAR) 23rd Annual Assabet River Cleanup by trash patrolling the Acton section of the river upstream of the Powder Mill Dam. This is a part of the river that is still haunted by memories of sewage sludge accumulations in the impoundment behind the dam. They were the result of poorly treated wastewater in previous decades. Fortunately, wastewater treatment operations have been greatly improved over the ensuing years and Mother Nature has not wasted any time in working to reverse the damage from past degradations. Acton Hydro's operation is designed to utilize actual throughflow of the river and therefore only generate electricity when river flows are high enough. Unlike traditional hydro operations, they will not store water behind the dam in order to generate around the clock, and this will allow the river to flow more naturally. Working upriver I arrived at the point where the river begins to narrow. In the fairly recent past, someone, I believe it was an Eagle Scout, erected a platform here that may eventually be used by an osprey to build a nest on. There is a washing machine on the river's east shore near the Acton/Maynard town line. At this point in the patrol, a few claps of thunder were heard and operations were briefly suspended until things quieted down. Following passage of the thunder activity, the patrol was resumed for another half hour or so, before returning to the take out location where it was "All ashore that's going ashore". The count was 126 pices of trash. Of these 54 were recyclable (25 redeemable) and 72 were misc. 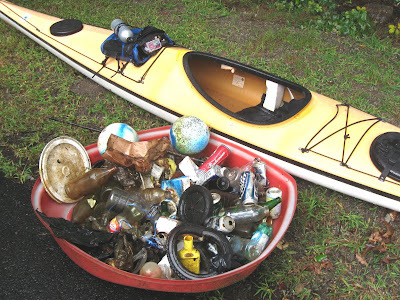 rubbish such as styrofoam, plastic, small tires, broken glass, etc. My YTD total stands at 3950. 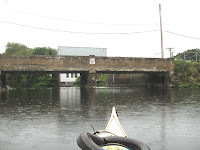 While I was working my area, others in the Acton contingent were working downstream of the dam and volunteers in other Assabet River towns worked their sections as well. All of us worked through the morning's nearly steady rain. Apres-cleanup, volunteers gathered in the Damon Mill building's atrium to enjoy donated pizza and receive their commemorative t-shirts. Tomorrow, when the sunshine returns, the Assabet River should be showing off a freshly scrubbed look as a result of everyone's efforts! There is a flag flying in behalf of your efforts and those who joined you. Look towards the flag hoist~~~~BZ has been raised.